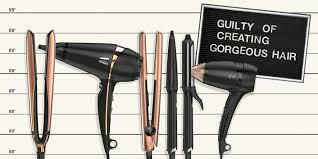 GHD’s… FOR AN AMAZING FINISH! Achieve criminally smooth results with the ghd V copper luxe premium gift set, featuring our award winning ghd V gold styler in a new copper luxe finish. Each ghd V classic styler features advanced ceramic heat technology delivering the optimum styling temperature to create sleek and smooth everyday styles with enhanced shine. The rounder barrel and smooth contoured plates allow you to create bouncy curls, tousled texture and the ultimate sleek look, so you always so you can be ready for whatever the party season throws at you. The ghd V copper luxe premium gift set comes complete with a coordinating copper luxe heat-resistant bag to stow away your styler, and limited edition NAILS INC® polish to complete your look. With a protective plate guard and universal voltage, the ghd V copper luxe styler is always ready for action, wherever you might travel. Plus, peace of mind with sleep mode as standard, which automatically switches your styler off after 30 minutes. Be as bad as you like but be good to your hair, with the innovative ghd platinum® copper luxe premium gift set. Featuring the ghd platinum® styler in an envy-inducing copper luxe finish, complete with copper sparkled precision milled, floating plates and matching wishbone hinge for greater control while styling. Each platinum styler contains our patented tri-zone® technology using three sensors in each plate to maintain a safer-for-hair heat, delivering 50% less breakage* and 20% more shine**, giving you guilt free results, every time you style. Each limited edition gift set comes complete with a copper luxe heat-resistant bag to stow away your new ghd styler, and two limited edition NAILS INC® nail polishes designed exclusively for the copper luxe collection; in light shimmering gold and a deep, smokey copper. Please contact the salons for further information. Thank you Daisie Wicks for my lovely lashes. I love them and I love you!